All Photographs and Enhancements of the Myakka Photographs on this page are © David Barkasy and Loren Coleman 2001. It all began with a December 22, 2000, letter signed “God Bless. I prefer to remain anonymous,” mailed to the Sarasota (Florida) Sheriff’s Department. Two photographs were enclosed. I’ve written about this extensively, so for some quick details, merely click here. For this blog, it is more about just re-viewing the images, not reading the words. Let’s look. I’d like to see more progress on this one, either pro or con, in 2007. Here’s a selection of the photographs, with details like the hand or foot that can be seen at the bottom of one of the photographs, comparison of the photos to show the leaf in the mouth does change position, and facial comparison points with an orangutan. Some critics have said that the object photographed in Florida was really this reddish Bigfoot Ripley’s Believe It or Not model in Wisconsin. I say the “classic” posture for any Bigfoot sculpture is going to poorly imitate the Patterson-Gimlin footage. Besides, several items between the two don’t match, but here it is for your examination. Others have said the Myakka thing is a person in a dark straight-legged costume from an Oriental source, but here too, definite reference points don’t align. So what was photographed in Florida by an elderly woman in her backyard in the fall of 2000? Who is that person? What do you think? This entry was posted on Sunday, December 31st, 2006 at 10:29 pm and is filed under Breaking News, Cryptomundo Exclusive, CryptoZoo News, Cryptozoologists, Cryptozoology, Evidence, Eyewitness Accounts, Forensic Science, Out of Place, Skunk Apes. You can follow responses via our RSS 2.0 feed. You can skip to the end and leave a response. Pinging is not allowed. Whatever it is in the picture appears to be a real creature to me. I think it is either an orangutan or the Skunk Ape, but if I had to bet, I would put my money on it being an orangutan. Th eyeshine from the camera flash had me thinking it was a real animal from the first time I saw these photos. I’m not up on orangutans as to size when on their hind legs compared to humans. So I must leave my guess at it is a a real animal whatever it is exactly. The orangutan explanation seems to fit best. The dark coat kinda throws me, but if thats a result of this picture being taken at night, then that would explain why its not more reddish. Also, I read that old males tend to be more ground dwelling than younger animals who are mostly arboreal. So if I had to guess, I’d say an escaped/released orangutan. Yeah, I would concur with the others that these photos are probably that of an orangutan. When the photos were first released that was my immediate impression. Florida tends to be a hotspot for escaped or released exotics. What throws me is the branch covering the animal’s mouth. Do orangutans do that in the wild? If it is an ape, does it have an incomplete sense of “object permanence” and therefore thinks: “My face is covered, therefore you can’t see me.” Or it could be covering up a defect in a costume as well. I thought the eyeshine was very convincing at first, then I read that some costumes have reflectors built in to them. So I don’t know. The comparisons to orangutans are pretty similar, but there seems to something “off” about the pictures. It could be an orangutan, but then again some think there are several species of cryptid hominids in North America. So I’m pretty undecided on this one – possible hoax, possible orangutan, possible ???. Orangutans are reddish brown, this thing is black or charcoal color. It’s either real or a costume. 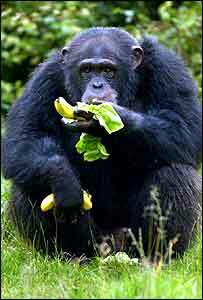 It COULD be a real chimpanzee tho’…Maybe a Tarzan movie escapees offspring. The white area’s look almost TOO white-sort of Santa Claus fake beard white, but it could be from the flash. First time poster here. I’ve lurked for awhile, but, I feel I need to share some info with ya’ll. When I look at these pictures I think Orang. But, the Saw Palmetto the critter is standing behind throws a monkey-wrench(pun intended)into that train of thought. I was born and raised in Central Florida and am a lifelong resident here. Behind my house, there was a huge stand(acres and acres of the stuff) of Saw Palmetto growing amongst the pine trees. I spent my childhood playing out in those woods running thru that stuff. You had to dress appropriately before going through Saw Palmetto and exercise care because Diamondback Rattlers often live amongst those thickets. The fronds of Saw Palmetto are serrated and there are thorns on the stalk of each frond, they will chew you up if your not careful. The plant in those photos looks like an older growth speciman. I’m relatively certain the top tips of those fronds are between five and six feet tall. Now, I’ve never seen or even heard of a six foot tall Orang before, so this is something that troubles me. And, as I look at those pics, I see one really large ape crouched/standing there. Well it wasn’t a cardboard cutout as some folks have said. Other than that I’m not sure what to make of it. I’d be a lot more comfortable with it if the person who took the photos would come forward so the negatives (if any) and the site where the pics were taken could be examined. I remember when these were first posted by you, Loren. The apparent lower canines are somewhat curious; is that an orang feature? Do they have lower canines? I have no idea what is positively shown in these pictures, without more background details. An assumption is being made here that the photographs follow the same primate patterns as an orangutan’s because that is what this seems to appear to be to the one asking. But where are the records of escaped or captured orangs in Florida – or anyplace in the southern USA? There are more records of Skunk Ape encounters than examples of escaped orang stories. But I can answer these questions in many ways. Ape costumes may have large lower canines and those inside the costumes may be using leaves to cover other things than teeth. Apes, mostly males, have large canines, top and bottom. Apes, in general and orangutans specifically, do have an oral fixation and do carry leaves around in their mouths. Photos are available on the internet and in books of this behavior. Loren’s ‘Orangutan baring teeth,’ link looks about the color of the Myakka animal also, which shows the color is reasonable. The Saw Palmettos are truly sharp and hide rattlesnakes, although some do have them in their landscapes. It is looking to me that the animal took a sharp jab to the inside of its mouth that night. I have no question as to whether this is an animal or not. I am 99% sure this is an animal. Have been since the first time I viewed the pics back in ’01. My question is, where were they taken ? The photos came to the authorities anonymously. Which means that no comparison can be made of the area the photo was supposed to be taken. I live in Central Florida, and have some land, I also have Saw Palmetto on my property. However, it is not something that is used in landscaping around homes. Anyway back to point, the picture could have possibly been taken at a ‘zoo’ or preserve. They are peppered all over the state. There is an older safari ride right down the road from me. The point being if I wanted to ‘hoax’ a photo, or claim it to be the Skunkape, but had no Palmetto in my yard being a smart hoaxer I would make up a story and send it anonymously. As for the reports about missing animals, the safari ride down the road from me lost several animals during the ’04 hurricanes. I am sure the FWC was called as they were riding up and down the roads looking for the animals. However, the story never made the news. Maybe they were not predatory animals ? perhaps no one living in the country has Saw Palmettos in their landscape, but I am pretty sure I have seen them in the flower beds of some city houses. Anyway, interesting idea on a zoo photo. Anything is still possible at this point. I’m new to posting, but a Florida resident, and I have a few observations. I’m not at all convinced that this picture is of an Orangutan. First off, I live rather close to Lion County Safari which is in Palm Beach County off of Southern Boulevard, and yes, they have had escapees in the past, but any escapees are usually taken note of by the FWC, and usually recorded. But the biggest thing for me is the eye shine. No known Great Apes have eyeshine, because they are diurnal. Just pointing that out. Here’s my take on this. Living animate unknown primate. First off, looking at the movement of the 2 pics, it is acting exactly as a frightened animal would act when surprised by the flash, as it was, backwards and away. Saw palmettos do range in the 6 foot high range, and this thing would need to be that high to correspond the way it does to the fronds, during those pics. That height along places it out of the realm of a known Orang, which doesn’t mean it isn’t a mutation of something left over from the Tarzan days, but if that is the case, it would still be an unknown ape. The toes are weightbearing, and to prove this point, look at the exact place that the toes are pressing on the leaves,slightly indented, and then look at the end of the leaves, and you can make out that they are bent upwards and free of the ground. That means if this was a costume, someone would have to have long slender toes that would fit neatly inside. If one didn’t have those exact toes, their foot would end where the gangly toes began, and the ends of the toes would not be planted on the leaves, they would be slightly bent at an upward angle. They aren’t, which lends credence to the fact that those are real toes. There are certain Orang similarities, to be sure, but what exactly does an unknown primate look like anyway? Does a bigfoot have gorilla-like features? Do Napes look like giant chimps?? All primates have to look like a primate in some respect, it’s what makes a primate look like a primate. Great apes and human do not possess tapetum lucidum, which is found in many mammals who are rarely diurnal and mostly nocturnal, such as dolphins, dogs, cats, alligators, bears, cattle, deer, horses, opossums, raccoons, owls, rabbits, rodents, and sheep. Humans, however, despite not having tapetum lucidum, do display a red-eye effect, in some cases. Just look at those old photos of your relatives from holidays of the past. This is caused by the light from a flash traveling faster than the iris can close, and the blood-rich back of the eye reflecting light (that appears red) outward through the eye’s lens to the camera. Grey, blue, and children’s eyes are the most frequent human eyes that produce red-eye. The red-eye effect is also enhanced by the use of prepackaged, disposable cameras. In the case of the Myakka photographs, the eye-shine is unique in being mostly white with a little red on the edges. See here. White-eye effect is found instead of the usual red-eye in humans sometimes when the individual is suffering from the cancer of the eye called retinoblastoma. The white-eye effect could have been produced by a variety of causes, including being from the eyes of a form of more nocturnal great ape (Skunk Ape?) still unknown, from the eyes of a diseased human in an ape suit, or from an ape mask that has reflective artificial eyes on it. I remember seeing these photos several years ago and wondering if they were real. The skeptic in me says this is a hoax. First, if the “eyeshine” is due to the fact that the camera flash and eyeball iris movement are not synchronized, I would think that in the second photo the shine would be diminished or not present since the subject moved slightly, the iris had adjusted and the photos seem to be taken in a fairly rapid succession. Whichever of the two photos is the second one, I would also think the “animal” would show some sign of surprise at a very bright light having just been flashed in it’s eyes from a seemingly close range. A guy in a costume with his eyes not exposed would have no reason to flinch. Also, in this day and age when many ordinary people are incredibly desperate for their 15 minutes of fame, I don’t know why the person who took these incredibly up-close photos wouldn’t want to cash in somehow. But it seems to me that there are two species of hoaxters: the kind that have absolutely nothing yet want recognition (Dominick Perez, I’m looking at you), or the kind that have some kind of “great” evidence and want nothing more than to have their name as far away as possible from it. I believe this to be the latter. agreed on the Loren’s comment, above… And as you said, red eye is most common amongst light-eyed individuals, I don’t know of any apes that have anything other than brown or black eyes. Can such apes get redeye then? THE COLOR IS NOT AT ALL LIKE AN ORANGUTAN! IT is charcoal NOT reddish brown. I have NEVER seen an orang with any other coloring than reddish brown. I’ve been to a lot of Zoos and watch the animal planet, and look at animal photography all the time. What immediately struck me about these pics is how terrifically leftwardly off-balance the ‘critter’ looks in both its semi-crouching position and its rearing upward and backward position. This out of kilter appearance became still more apparent when I was next struck by how in spite of its head rearing significantly upwards and backwards, its right arm swings closer towards the camera without the elevation of the linking ‘shoulder’ changing sufficiently to physically accommodate this new posture, i.e., the head, the arm, and the ‘shoulder’ move in a way that makes the three parts of its ‘body’ seem distinctly physically unconnected. This observation was still more screamingly underlined for me when I was then struck by how even when the head moves from its forward to its backward position, the facial expression of the ‘critter’, particularly its use of its eyes, remains utterly unchanged. Finally, I was struck by how the ‘shoulder’, which looks much closer to a hunch or a hump to me, was clearly situated directly atop the vertical aspect of the critter’s actual centre of gravity, leaving me in little doubt we are dealing with a sort of home-made dimestore level budget animatronic puppet, operated by person or persons unknown located directly under the hump. Either that or it’s the little old lady herself before she’s gotten round to brushing her hair, putting her make-up on, and putting in her false teeth. Cold Case indeed. I remember when these photos first hit the web, looks like an old Orang, and there was a rumor that this was a zoo photo. But, no one has found a matching old orang at any Southeastern Zoo. So, we still have a cool mystery and a funky looking cryptid. I speak from first hand experience when I say that the creature in that picture is not an orangutan. I worked with orangs for over 7 years and that animal is nothing like orangs. Perhaps it is a different species of a sasquatch? It does appear to be a living animal and it does have plenty of similarities to an orang. In the end the Myakka photos will probably hang around as a mystery for a while. Are you sure you are not thinking of Sago Palms ? They do tend to appear some what like a Palmetto. Very slow growing and do not usually get over 6 feet tall. Another popular plant used that has a Palmetto appearance is the Spanish Bayonet. I have plenty of those around the house. They grow very fast and tend to bunch up, looking like a Palmetto. The more I look at it, the more the piece of foliage in front of his nose bothers me. Note that in the first picture this strand of foliage is not connected to anything, while all the rest of the fronds are. This is also seen clearly in the second picture. The fronds appear suspended in the air. Notice also that you can see the dentation of the ape clearly: the teeth are clenched and the fronds are not being held in its mouth. So, best guess for now, it is a real ape who has suffered the indignity of digital manipulation. The remarkable thing to me would be the lower canines. They seem to be “thinner” than I would think typical of an ape. Also, while at first glance the thing resembles an orangutan, it seems to be too lanky. Possibly skunkape_hunter, They were never in my yard growing up, so it is possible. I can see the animal being surprised by the flash and raising back, but I can also envision being surprised and moving just wrong because of that to get a shrp jab in the maouth from that leaf on the foreground plant that appears to enter the mouth in the ‘bending down’ photo. My first “up close and personal” encounter with the Fla. Skunkape was nothing like an Orang, nor the other two encounters. At seven feet tall, and less fangs, there was a world of difference between the Orang and these hominids. Two of which were daytime meetings. The foliage in the mouth area also discourages me from believing this is a real animal. It looks to me like it’s been planted there (pun intended). I would think that if this “animal” is a guy in a suit then the eyeshine could be from the (Caucasian or light-skinned) human’s fleshtone underneath the mask showing through the eye holes. The hand doesn’t look weight-bearing to me. It looks like it’s just hanging there. Better images that very nearly match this mouth-leaf-carrying-behavior are available in texts and photographically-driven books on orangutans, chimpanzees, and bonobos. As far as the nose-leaf thing, it is entirely possible for the Myakka to be fooling around and stick a palm frond on its face, as I have done numerous times with a wet bubblegum wrapper. Is eye shine and red eye the same thing in photos? Cause I always get red eye when my photo is taken. As far as the possibility of the plant being a sago palm, that’s a no. Sago palms DO look palmlike, but they are not Palms but gymnosperms. The way to tell the difference is to look at the frond – Palmettos (Sabal palmetto) have leaflets all stemming from a single point at the end of the stem, while Sago Palms (Cycas revoluta) have all the leaflets stemming along the length of the stem. I’m not a botanist, but have a lot of experience with Florida plants being a biology major and getting out into the Florida bush every week catching snakes. I’d also like to hear everybody’s opinion of that mouth leaf. That leaf is NOT from any of the palmettos in the picture, so is likely to be from elsewhere. Wouldn’t a hoaxer just grab some of the immediately adjacent leaf-litter? Just a thought. Hey, and while I’m out in the glades looking for pythons this year, I’ll keep an eye out for this fellow. Well, it looks fake to me. *ducking and running*. LOL! First of all, here is a pic of an Orangutan with it’s mouth open. There are two species of Orangutan still living. If anything, this “animal” would have to be the Bornean which actually are a dark brown in many cases, but have a short squat body and a super wide face, like this one. Yes, the older ones can have long canine teeth, however, they’re wide at the base at the gum line and they point outward at an angle whereas the ones on this specimen appear to be quite thin, and tubular, and fake. If it has lower canines then it will have upper ones as well. It just doesn’t look real to me at all. The body shape is all wrong for an Orangutan and as far as I know, they don’t stand up that straight, either. The leaf bundle in the mouth does appear like it is more ductile and shinier than the mature fronds of that palmetto. I wonder if the creature was plucking new, tender growth from the plant when it was rudely disturbed by a camera flash? Here is a wild idea. What if it’s a dog? The long face could be foreshortened by the camera. The only troubling thing would be the hand/paw. However since it is obscured by the plant, maybe we are filling in details that aren’t there. It could be a regular dog’s paw, but with long nails and long hair. The grainy pic just makes it look like a hominid. Dogs with strange paws have misled in the past (e.g. Maine cryptid). I prepared a jpeg to prove my point. What is in red is where I think the image truly ends. The shiny tip of the nose is just visible over the palmetto frond on the face. And the “fifth” finger I believe to be just be a shadow, as it is too blurry and has no detail. I outlined it in yellow. despite the “back & forth” over the red eye, the leaf in the mouth, and the weight bearing toes….my thought is, How did someone get this close to one of these creatures and get not only one photo, but two? I mean really? If this is a wild creature(regardless of what it is)in the wild doing it’s thing…how did somone “sneak-up” on it (to that range) and take two photos? I’m an avid hunter and outdoorsman. I have yet to stalk anything truely wild to that range and still have it there to take a picture of it. And this thing looks like it could eat your face off. It’s just weird to me someone could get this close to this thing. Please re-read the letter…see the link in the first text paragraph. An automatic camera has a rapid-fire flash. If the description is true, she notes the cryptid froze on the first flash, and then she quickly took a second photograph. She says she didn’t even see it in the dark, and aimed the camera in the direction of where she thought it was. It may be a hoax, or something else like an animal photographed some place else, but how exactly do we think something like this is going to happen someday? How else but perhaps in a fashion as seemingly unbelievable as this way? With a chance encounter? With an elderly person who stumbles through the dark and keeps taking pictures? Why would it not be an extraordinary linking of a series of good luck moments that might result in something like these photos? I find the controversy of the validity of these very natural looking photos to be typical. The skunk ape in the photos is however I believe one of at least two separate species that wander the states swampy regions and very inaccessible cypress forests. In my research on these guys I have found that the ape in the Myakka photos matches exact descriptions of what seems to be an elder or very old ape of the variety that more resembles, in facial structure the orangutan. I have spoken to others and read at least three other eyewitness accounts that state that the creature had long gray hair, and looked more monkey like, than human. Then there are what I like to call the Swamp apes. Based on eye witness testimony, and photographic evidence including Davids’ and the fire chief’s photo, from the glades area, they appear to have much shorter arms and a more man-like shape in general. At least two different eye witness photos confirm this. I believe David’s photos are genuine and he is not a fraud as some have stated. The Myakka photos seem very natural to me and only a sense of innocence could prompt a the letter to the local authorities. I would like to know just how many homes are close enough to I-75 to prompt the “elderly woman” who sent the letter to the cops to worry about the thing causing traffic accidents and getting itself injured on the highway. Perhaps that is a lead into finding the elderly couple who wrote the letter? How many homes are close enough to I-75 In the area in question. maybe a thousand, maybe only 10. the area in question appears to be very underdeveloped on a topographic map. also I noticed several fruit orchards in the area, not just orange groves but guava farms and kiwi as well a vegetable farms. The entire area around Myakka state parks 37,000 acre state park is a variable feast at all times of the year, with seasonal fruits and veggie farms sporting many hundreds of acres of prime “night time” feasting for the apes. In my opinion after many, many hours of research, including a map of sightings outside the glades area, in comparison to farm location the apes are almost always sighted within a few miles of a farm or a major forested area near some type of a farm. I believe this to be a viable pattern in the possible means of tracking a Florida skunk ape. I believe they are using our Florida fruit and veggie farms as their new major source of diet. They’re not too stupid to pass up an easily accessible never ending meal. It only makes sense. A creature like this would need enormous amounts of vegetation and although Florida’s pre-farm ecosystem was and probably still is enough to support the diet of an ape of this type. The apes would, I believe, eventually find and instinctively migrate yearly to the “new” food sources they found to be plentiful; I.E. our new farming industry. I believe the people who we should approach in regard to many probable unreported sightings are Florida’s migrant worker population. these people would be our most likely candidates to not only have seen the apes but possibly interacted with the apes. our migrant worker population is huge in accordance with our farming industry. They are the real hands on farmers.